Tissue paper cutter(JY-330S Series) - Jiuhyan Precision Machinery Co., Ltd.
• Rotating and Revolution round architecture with a circular blade. Smoothly at the speed up to 80 times per minute. • Set the sharpen counter, sharpen time and grindstone forward according to cutting times. Ensure the blade keep in sharpness. • Multiple Cutter Blade Protective Architecture (Protective Fence + Safety Door +Sensor), provide Blade install tool kit for safety install and disassembly. 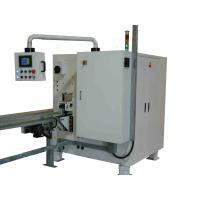 • Use Man-Machine Interface Operator to set the cutting speed and length. • Display the D/I and D/O status of PLC and Error Code, very easy to diagnostic and maintenance. Flexible Plastic Clamp with a big range core diameter adjustment.